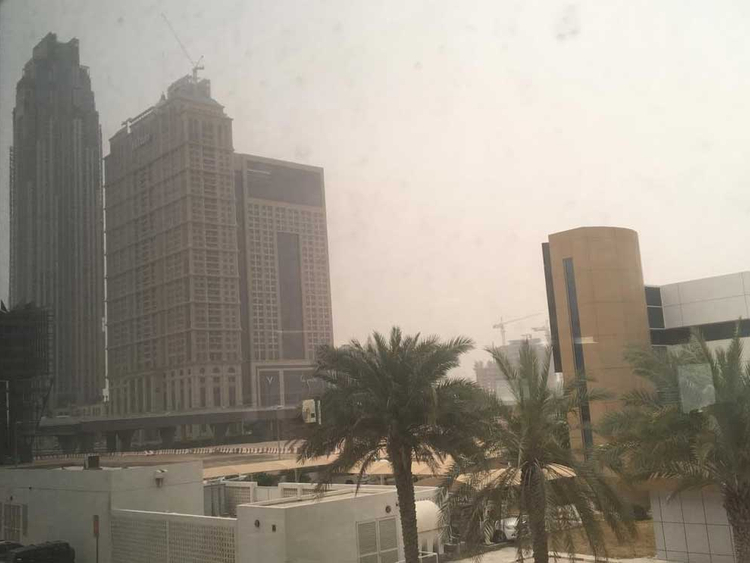 Dubai: Expect intermittent rain and thunderstorms and at times windy and dusty weather over the next few days — possibly until next week — as the UAE transitions from winter to summer, a forecaster said. Clouds of dust covered most of the country on Monday and Tuesday, bringing visibility to 1,700 metres in Sweihan and 2,000m in Liwa. The unstable weather will continue possibly until next week. The maximum temperature during the day will be in the low to mid-30s C. The lowest temperature was recorded at 14.3 degrees C at Jebel Jais in Ras Al Khaimah at 5.15am on Tuesday. Light rain was recorded over many parts of Abu Dhabi in Madinat Zayed, Al Dhafra, Abu Dhabi Island, Al Mafraq and Mussafah, Al Shahama and Khalifa City. Scattered areas of Al Ain received light to moderate rain. On Tuesday, weathermen also reported rain over Qarnen Island. The forecaster stressed that weather like this is not uncommon as during the transition period in the UAE. By Tuesday evening, another round of wet weather is expected accompanied by thunder activity over the northern and eastern part of the UAE at times.